Competition for online shoppers is intense, and the industry seems only to get more competitive over time; this competition is why business owners should familiarize themselves with some important information when choosing an e-commerce vendor. This information makes it easy to select the company that offers the right blend of features, scalability, accessibility, and security. The right e-commerce vendor will help a company earn customers’ trust and increase the business relationship with those customers over time. Before committing to any of the biggest names in e-commerce, consider a few key things to look for. Perhaps there was a time when security wasn’t the first consideration made when partnering with an e-commerce company, but that time has passed. Today, online commerce accounts for a significant chunk of economic activity. The practice has also put customers’ sensitive information, from credit card numbers to social security numbers and more, at serious risk of being stolen by hackers. Because building a customer relationship is all about trust, today’s newest online storefronts must show that they are highly secure and backed by some of the best encryption technologies in the business. When shopping for an e-commerce vendor, make sure to look at their security technologies and how those technologies are incorporated into the shopping, checkout, and data maintenance process of the online retail experience. A company with a good security policy makes a great choice. The opposite is also true. While security is the key to building trust with customers, rapport depends on being able to interact with the storefront and mingle with other customers who are interested in the same product. That’s why so many e-commerce vendors offer product reviews, customer suggestions, social media sharing options, and much more. When choosing between several vendors, go with the one who has the best option for user engagement and interaction. This will foster a sense of community that builds the store over time and creates a more loyal audience of repeat customers. For a small business online, this can be one of the most valuable assets of any storefront from any vendor. 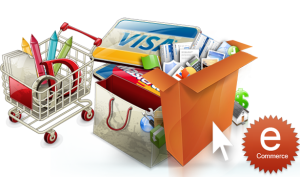 Some online commerce software vendors allow their customers to setup traditional methods of payment, including credit cards, debit cards, and even PayPal. Others are more restricted, offering only credit cards or only PayPal. Because customers use a variety of technologies and payment tools, the best option for a new online store is to accept the largest number of payment methods available. This means that any vendor should offer traditional “plastic” payments alongside electronic methods like PayPal or similar sites. Sometimes, it might also be a good idea to look into whether or not the vendor’s solution is compatible with international transactions or currency conversions, since most online storefronts routinely reach an international audience. Commerce software from a vendor will, at least initially, look pretty “vanilla.” These storefronts come with a standard template designed to appeal to the largest possible group of online store owners. Customers, however, will want to see something unique and identifiable with the store’s brand. Make sure that the vendor can offer full customizability, along with full technological compatibility with a site’s existing software, design elements, and future growth potential. The cost of the software, which is typically paid either as a monthly fee or a percentage of sales, should also be negotiated or clarified. According to Entrepreneur, with these crucial pieces of information available, online store operators will find it much easier to get their business off the ground. Furthermore, review this important information when choosing an e-commerce vendor makes it easier to operate the store profitably, flexibly, and with an interactive community that enriches the core business.